ARTlington Studios and Gallery is once again hosting a visual feast for your art senses at this year’s Nuit Blanche 2017! The 20+ artists of ARTlington are coming together for this annual free all-night celebration of art and culture that is happening worldwide and we invite you to join in! Check out ‘Warm & Bright‘ on facebook for updates! It’s that time of year again – where Crystal Nykoluk and I mop the studio floor and throw open our 3rd floor ARTlington Studio door in a festive celebration of the handmade. This year the Studio 6 Ceramics’ Warm & Bright Show and Sale has expanded to include the entire ARTlington Studios building! Warm & Bright will now feature three floors of over 20 professional Winnipeg artists creating contemporary works for homes and business alike; painting, pottery, jewelry, sculpture, photographs and more. On Saturday December 3 from 12 – 2pm we will be joined by the lovely and talented Anne-Marie Williot of Chez Willi ! If you plan your visit for this time, be prepared for Anne-Marie to lead you on a journey to a land of cobble stone street and candle-lit cafes. Weaving memorable melodies with relate-able lyrics, Anne-Marie is well known to have everyone laughing, crying and singing along in her presence. And if all that isn’t enough, those of you familiar with Warm & Bright will know to expect our signature sangria being served throughout the sale in our studio. We are waiting for you! Come visit us December 2 & 3 to discover a Winnipeg hidden gem bursting with creativity. Heritage Winnipeg will be presenting the 13th annual Doors Open Winnipeg event on the weekend of May 28 & 29, 2016. This free annual event celebrates Winnipeg’s unique spaces, architecture and history, showcasing more than 80 remarkable buildings and sites. I will be opening up my studio space in the wonderful building that is 618 Arlington during Doors Open, allowing visitors to shop while learning the history of many of the city’s architecturally stunning and historically significant buildings. Cost includes clay, materials and firings. If students have their own tools they are encouraged to bring them, if not they will be provided with communal studio tools. This class focuses on learning various techniques (including glazing and decorative) related to throwing on the potter’s wheel. Open to all skill levels. Classes run for 9 weeks with a break at the end of the session to prepare student work for glazing, giving each student 8 three-hour classes to be introduced to a variety of ceramic techniques and projects. With only 5 openings in this class, students will be given ample hands on direction and guidance, leaving the class with their finished pieces of art and a new appreciation for mud. A deposit of $127.50 made payable to the Edge Clay Centre is required by April 8th to reserve your spot. Ready to register or have any questions? Interested in a different class? 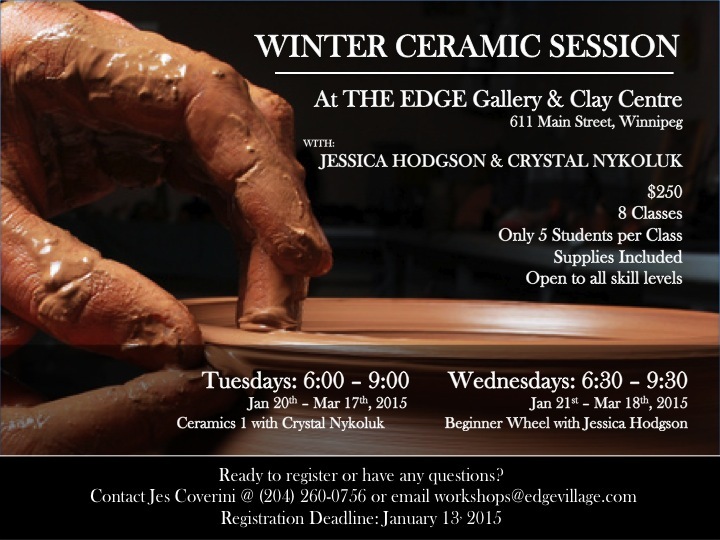 Check out http://www.edgevillage.com/ceramics-classes/ for other available classes! The hibernation is over; the layers have been shed. We are ready to expose our skin to the sun, welcoming new energy, new connections and new opportunities to start fresh conversations. We’d love to have you come visit our studio on May 1st to see our ‘raw and recent’ ceramic work along with old favourites. Free street parking on Arlington outside the building. You will be introduced to hand building, which includes slab building, slump molded forms, and throwing on the potter’s wheel. From basic thrown or hand-built forms you’ll produce mugs, bowls, and platters. You will also learn glazing and decorating techniques to finish your work and will be encouraged to develop your own ideas in functional and non-functional forms. Open to all skill levels. Please contact your instructor by April 7 to reserve your spot in the class. There are only 5 spots available in each class, so they fill up quick! A deposit of $125 is required to reserve your spot. Full payment can be made the first day of class. Questions about the class or ready to register? 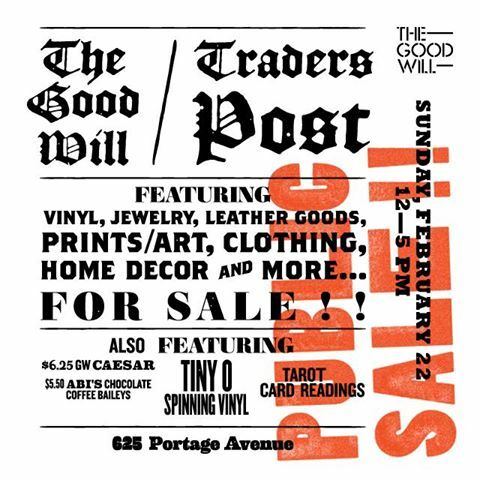 First ever Sunday pop up market at The Good Will, featuring local traders of vinyl, fashion, accessories, vintage, art, prints, home decor and so much more. Also featuring Abi’s Chocolate Coffee Bailey’s; feature Sunday cocktail; DJ Tiny O, and tarot card readings by Trevor resident psychic. Be social….shop eat drink! Kids welcome.